Relational shapes help students make mental connections as they compare shapes. 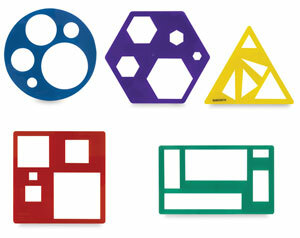 That's why this set of five labeled templates is so great, each containing five circles, triangles, squares, rectangles, or hexagons in varying sizes and orientations. Even the outer edge is a large shape! ® Learning Resources is a registered trademark.